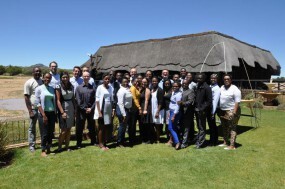 The first EQuIP training event was hosted by the Namibian Ministry of Industrialisation, Trade and SME Development (MITSD) in Windhoek from February 2 to 6, 2015. It brought together 26 participants from the country, in particular from the Industrial Development Directorate of MITSD and its regional offices but also other public and private institutions as the Namibia Trade Forum (NTF), the Namibia Investment Centre (NIC), the Local Economic Development Agency (LEDA) and the Namibia Manufacturers Association (NMA). The event was closely co-organized by the German Development Cooperation Programme for the Promotion of Competitiveness, implemented by GIZ. The focus of the event was to apply the EQuIP toolbox and training concept on a country specific case with experts from the field. Namibia has already devised its industrial policy strategy (“Growth at Home”) and but has a keen interest to increase its analytical as well as its monitoring and evaluation capacities.